The RadMediaPlayer designer provides a convenient Smart Tag which allows easy access to frequently needed tasks. You can display it by right clicking on the control in the design window, and choosing Show Smart Tag from its context menu, or by simply clicking on the arrow button on top-right corner of the control. Source - Enables you to pick up the path to the source media file to play. HDSource - Enables you to pick up the path of the source media file to play in HD mode. Poster - Enables you to pick up the path to the poster of the media. AutoPlay - Indicates whether the media file will start playing on load. StartVolume - Controls the start volume for the media player. StartTime - Controls the start time for the media player. Add RadAjaxManager - adds a RadAjaxManager component to your Web page, and displays the RadAjax Property Builder where you can configure it. Replace ScriptManager with RadScriptManager - replaces the default ScriptManager component that is added for AJAX-enabled Web sites with RadScriptManager. Add RadStyleSheetManager - adds a RadStyleSheetManager to your Web page. 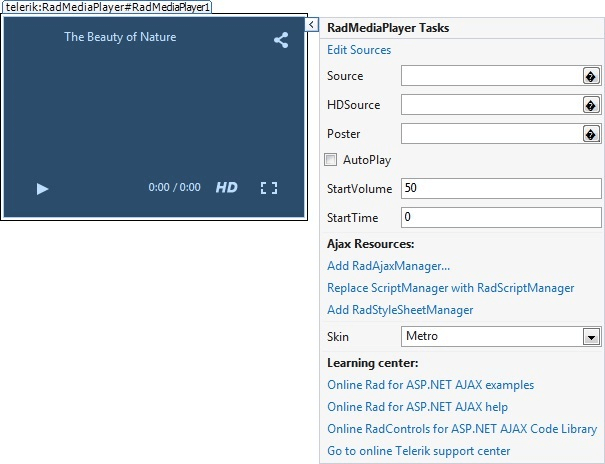 The Skin drop-down lets you select from a list of available skins to customize the look of your RadMediaPlayer control. Links navigate you directly to RadMediaPlayer examples, help, or Code Library. 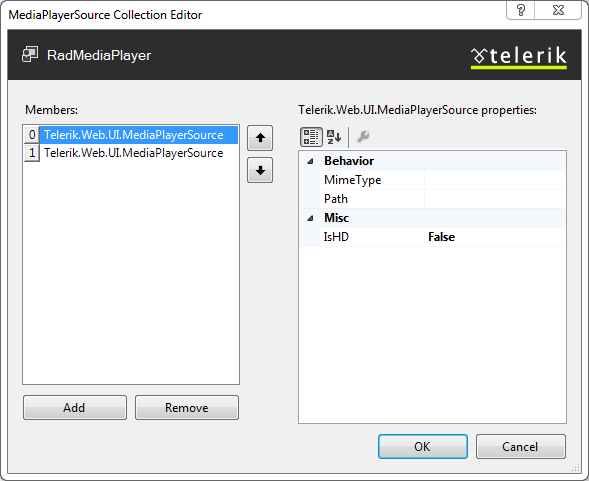 You can also search the Telerik web site for a given string. The Edit Sources link brings up the MediaPlayerSource Collection Editor which provides a straightforward and effortless way to add or remove sources to the player. You can refer to the Getting Started topic for an introduction sample with the designer.